Crane Certification Calgary - The Crane Certification training program includes content recommended by industry regarding the efficient and safe operation of cranes. People training would be taught the following: pre-operational, operational and post operating requirements; how to identify cranes and their component parts; how to determine overall lift capacity; rigging components and inspection/rejection criteria; and needs specific to the work place where the people training would be operating. Pre-operational requirements include assigning authority for the pre-operational check; doing the sequential pre-operational check based on the manufacturer's specifications or specifications certified by a professional engineer; inspecting the work place for hazards and obstacles; checking the log book for comments; checking chains, cables, hooks safety latches and crane movement; ensuring the proper functioning of operational controls; and learning how to ensure the disconnect switch/isolator of the crane is working properly. Operational requirements consist of identifying responsibilities and roles, and determining the need for a formal lift plan. People training will know how to carry out a hazard assessment associated to environmental conditions, physical circumstances and staff. Subject matter comprises determining when to seek competent help, the destination of loads and the safest route, and load weight and centre of gravity. 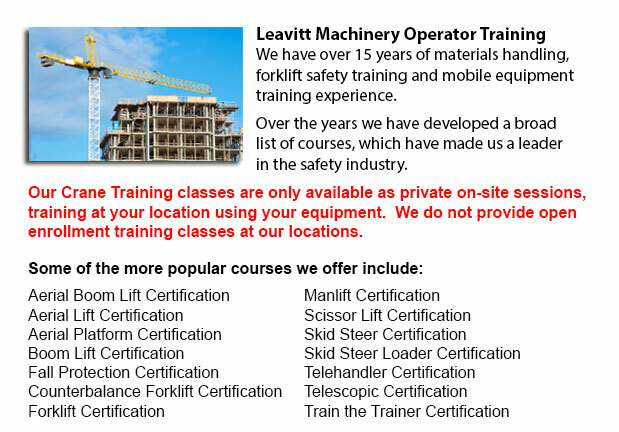 Individuals training must be able to identify an over-capacity lift, in addition to be able to pick correct rigging equipment, select load limitations, and to determine the safe position for the crane to operate from. People training would review both site-specific and universal crane signals for lifts, and methods for traveling, lifting and loading. Right maintenance practice will be covered. The person training would undergo an examination to test their understanding of emergency response procedures for various circumstances, specially electrical or mechanical failures. They will be asked to describe shut down and parking procedures for security and safety, to follow tagging and lock out techniques, and to explain why near misses are reported and recorded to the right individual. Log book records should be maintained. People training will develop knowledge of rigging, in particular, establishing who has responsibility and authority for rigging, identifying various types of rigging, knowing load capacity ratings and storage procedures. Post-operational requirements comprise entering defects or deficiencies, maintenance and service history in the log book, according to Federal, state and provincial codes requirements. In addition, we incorporate site-specific requirements to meet the employers needs into our crane certification training program.